Alectoris is a genus of partridges. Representatives of this genus occur in southern Europe, north Africa and Arabia, and across Asia to Tibet and western China. 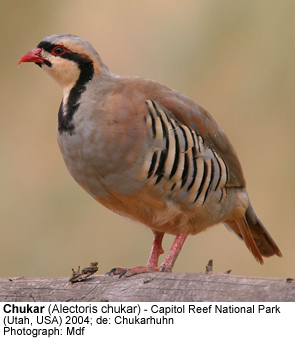 The Chukar and Red-legged Partridge (members of this genus) have been introduced to the United States, Canada, New Zealand and Hawaii. In some countries, such as Great Britain, hybrids between the two widespread introduced species are common. These resident (non-migratory) birds inhabit dry, open and often hilly country. When disturbed, these birds prefer to run rather than fly, but may fly short distances if necessary. The upper plumage is mostly light brown or grey. The chest is grey and the breast and the abdomen is buff. The face is white or whitish with a dark throat patch (gorget). The flanks are rufous-streaked flanks. The legs are red. The nest is a scantily-lined ground scrape. The clutch can consist of up to 20 eggs. Their diet consists of a wide variety of seeds and some insects.